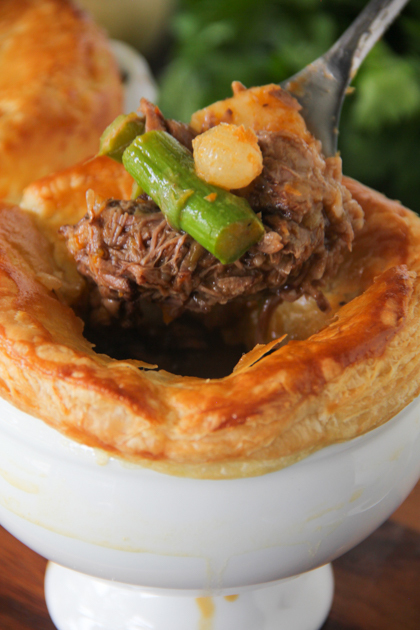 Decadent braised short ribs, asparagus and potatoes in this puff pastry topped beef short rib pot pie makes for a comforting Sunday Dinner. Hey Guys!! Long time no post huh? Let me apologize for the lack of consistency with my posts. Life with a newborn is not without its challenges. Baby Jackson has been keeping me busy to say the very least. I’ve been wanting to turn one of hubby’s favorite dishes into a comforting pot pie and shall I say it was the bomb.com. All the comforts of the world come bundled in this hearty braised beef short rib pot pie. YES and Amen!!! It may take a while to prepare but it’s so very worth the effort and totally drool worth in my opinion. A must try!! Decadent braised short ribs, asparagus and potatoes in this puff pastry topped pot pie makes for a comforting Sunday Dinner. Season each short rib generously with salt. Coat a pot large enough to accommodate all the meat and vegetables with olive oil and bring to a high heat. Add the short ribs to the pot and brown well, about 2 to 3 minutes per side. Cook in batches, if necessary. Puree all the vegetables and garlic in a food processor until a paste forms . When the short ribs are brown on all sides, remove them from the pot. Drain the fat, coat the bottom of the pot with more oil and add the pureed vegetables. Season the vegetables with salt and brown for about 5 to 7 minutes. Add the tomato paste. Brown the tomato paste for 4 to 5 minutes. Add the wine and scrape the bottom of the pan. Return the short ribs to the pan and add 2 cups beef broth or until the broth has covered the meat. Add the thyme and bay leaves. Cover the pan and place in the oven for 3 hours. Check periodically during the cooking process and add more broth or water, if needed. During the last 20 minutes of cooking add potatoes, asparagus and pearl onions. Remove the meat and veggies from the cooking liquid and discard the bones. Feel free to discard any huge pieces of fat. Cut meat into large chunks (don't shred it). Strain the cooking liquid (shouldn't be much) and remove fat with fat strainer. Add the strained liquid back to the pot. Add another 3 cups of fresh beef broth along with meat and veggies to the pot and simmer. Make the roux - In a small skillet, melt butter over medium heat. Add flour and cook for about a minute. Add roux to the pot and mix well. 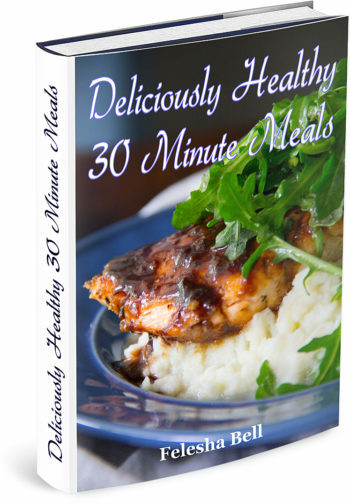 Thicken over low-medium heat for about 10 minutes or until thickened. To make the pies, preheat the oven to 425 degrees. Allow puff pastry to thaw for about 30 minutes. On a lightly floured work surface, roll out the puff pastry sheets one by one to get rid of the creases. Set a 2 cup ovensafe bowl upside down on a pastry sheet and cut a circle around it, making it 1/2 inch larger than the dish. Repeat with the remaining 5 bowls using all of the pastry sheets; discard the scraps. Put the 6 bowls onto 2 baking sheets and fill the bowls with the cooled beef mixture. Top each bowl with a pastry circle, pressing along the edges to seal. Mix together the egg and 1 tablespoon water in a small bowl to make an egg wash. Brush each pastry circle with the egg wash. Bake until the pastry is puffed and golden brown, 20 to 25 minutes.